Have you seen the eight-point economic plan of new President Rodrigo Duterte? Continue and maintain current macroeconomic policies. Accelerate infrastructure spending by fixing bottlenecks in Public-Private Partnerships. Amend the economic provisions of the Constitution. Provide support services to small farmers, tie up with agro corporations, and promote rural tourism. Fix the land administration and management system. Strengthen basic education and provide scholarships at tertiary levels. Update the tax tables and brackets. Expand and improve the Conditional Cash Transfer program. The oligarchs, who feared their days are numbered under Duterte, are happiest under this plan. It is as if Mar Roxas won – only better, because the people think change has come. The banner plan is the continuation – yes, perpetuation – of neoliberal policies of deregulation, privatization, liberalization, and denationalization. These neoliberal policies preordained the sellout, chaos, or decline of public services. Think MRT and LRT, public hospitals, and state colleges and universities. These neoliberal policies made them worse, starved them of public funds and turned them over to greedy Big Business. PPPs are the stumbling blocks to massive infrastructure spending. Why give public funds to Big Business when the state could do it and the “private partners” only aim for profit? The MRT and LRT are the biggest monuments to the fraud of PPP. The terms are so one-sided and unfair against commuters and government. No more, please, President Duterte. Take over the MRT and LRT, and save us money from the payments made to the private partners. The tax plan is to basically to keep the rates, and merely adjust the brackets and tables. Which was the most Roxas could promise, and pales in comparison to the proposals raised by other candidates. It is sad that Duterte’s team are not creative on the issue of taxes and could only give the middle class and entrpreneurs some vague, unsure reform. Keeping the CCT seems a mere consolation prize, as the Duterte team is silent on changing the priorities in budget-making. No commitments in raising budgets for health, education, and housing? Just give the people CCT. Raising budgets for these expenditures is a long-running demand of citizens. Because it means more hospitals, free college, and less “squatters” in the country – basics in poverty alleviation. Another area that makes oligarchs happy is the issue of land. Duterte misses the opportunity to democratize wealth, weaken dynasties, and raise millions of poor people. Why? His plan is silent on land reform. It is a plan only hacienderos could be excited about. All in all, the plan offers nothing new. The most diehard Duterte supporters may not find these as coming close to the change they expected and which Duterte promised. If the oligarchs were the stars under the Aquino-Roxas economics, they are set to remain the lords under Duterte – because the next president promises to continue the same set of policies. The workers, farmers, professionals, entrepreneurs, OFWs, and others who thought change is coming should brace for disappointment. Duterte can still revise this plan, by tapping progressive economists. There are lots of possibilities beyond the Aquino-Roxas economics he is planning to merely continue. 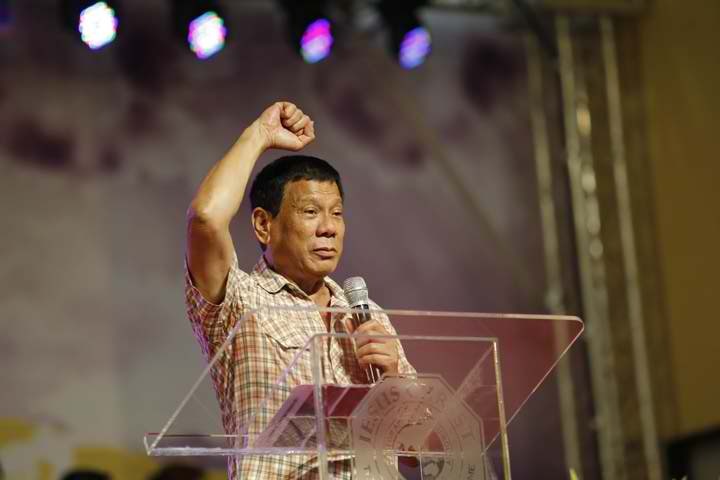 Duterte could better use his political capital by striking at criminals in business – the PPP scammers, the deal-makers, peddlers of destructive mining and dirty energy, the big foreign interests that push away lumads and grab their ancestral domain, tax evaders, taipans who get richer thru contractualization and low wages, greedy hacienderos who keep land the size of cities, and the like. This entails breaking away, not continuing discredited policies. Are we speaking too soon about Duterte’s plan? Can’t we give it the benefit of the doubt? No. Duterte’s economic plan should be denounced pronto. A carbon-copy of the present plan is not change, and should thus be exposed and challenged. Don’t worry about Duterte. He should be able to handle criticism. Worry about our people who may not get anything meaningful economically under the new president. The truth is: For a president who promised bold change, nothing could be called extraordinary in the Duterte plan. If you have doubts, just read the 8-point plan again and ask yourself, is this the kind of change we hoped that Duterte would deliver? First published in the Manila Bulletin on 14 May 2016. Edited and slightly revised for clarity.